(10-5) State takes care of business vs Alabama, coming away with a sweep. A trip to Arkansas will likely be a lot tougher. (10-5) Georgia drops a road series at Tennessee, 2-1. Dawgs host a dangerous Missouri team this weekend. (9-5-1) Aggies take 2 of 3 from Auburn in College Station. A visit to South Carolina is next. (9-6) Vanderbilt wins home series over Arkansas 2-1. Dores head to Alabama this weekend. 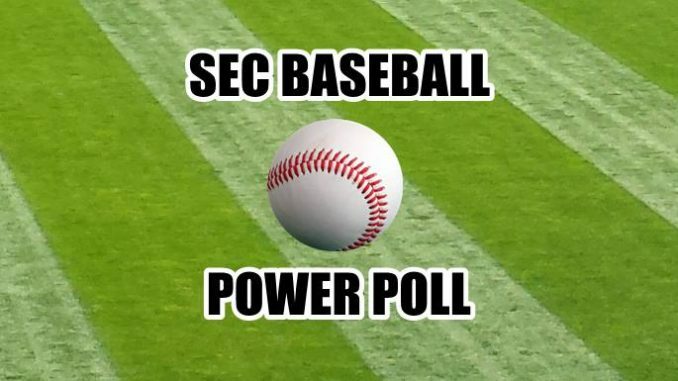 (9-6) LSU stunned at Mizzou with 2-1 setback. 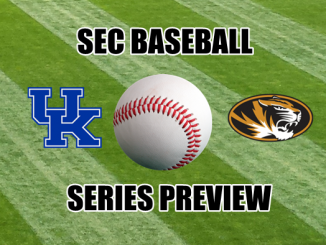 Tigers host struggling Florida team this weekend. (9-6) Arkansas suffers 2-1 series setback at Vandy. Hogs host tough Mississippi squad next. 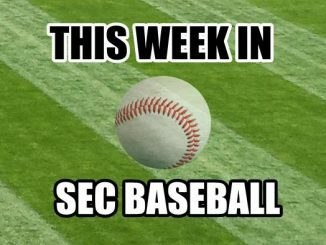 (9-6) Ole Miss falls to Kentucky 2 games to 1 in Oxford. Stunner. Rebs visit Auburn next. (7-7-1) Missouri gets a big time home series win over LSU, 2-1. Tigers visit an angry Georgia team next. (8-7) Tigers suffer 2-1 series loss at Texas A&M. 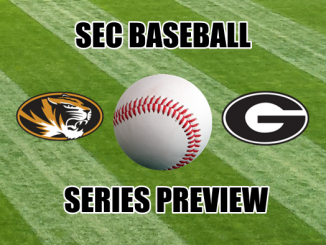 Auburn hosts Ole Miss this weekend in one of the better series of the week. (6-9) Florida gets a 2-1 home series win over struggling South Carolina team. Gators head for Baton Rouge next. (6-9) Vols down very good Georgia in with 2-1 series win in Knoxville. Vols visit Kentucky next. (4-11) Alabama is swept at Mississippi State. Tide gets visit from Vandy next. (4-11) Gamecocks lose 2 of 3 at Florida. USC hosts Texas A&M this weekend. (4-11) In a shocker, Kentucky wins 2 of 3 at Ole Miss. Cats host an improving Tennessee team next.